SHEILA CONNOLLY: I didn’t start out wanting to be a writer, much less a mystery writer, but I should have known better. At least, all the evidence was there. It all began with a Band-Aid. Really. When I was eight, I had a close friend who lived in the house behind us, and we roamed all over the neighborhood together (our parents would have been horrified if we’d bothered to tell them). One day we were sitting under one of the elderly apple trees in my front yard and discovered one of those metal snap-top Band-Aid containers, and near it, a used Band-Aid (aha! Call Forensics!). It was a part of the yard that few people ever passed through, much less with a box of Band-Aids, but the two of us sat there and made up an entire story to go with the skimpy evidence. Perhaps my favorite example: my mother’s second husband once lived next door to Edward Adams in suburban New Jersey. In case you don’t know, Edward Adams was the son of Harriet Stratemeyer, who in turn was the daughter of Edward Stratemeyer, head of the large syndicate that published (among other books) the Nancy Drew Series, which I devoured at a young age (when my 50-cent allowance could pay for one book). But wait! There’s more! I knew Ed Adams, so when his daughter was touring colleges, he asked if I’d give her a quick tour of Wellesley (which grandmother Harriet and I just happened to have attended), and a place to sleep. Of course I was delighted (although she ended up going to Harvard and became a doctor, not a writer.) It was years before I realized that I had done a favor for the grand-daughter of Nancy Drew (Oh, all right—she didn’t actually write all the books, but she wrote many of the plots and oversaw production and so on. Close enough.). Why did it take me so long to realize I was supposed to be a writer? I made detours through biology, art history, municipal finance, professional genealogy, and non-profit fundraising. (You may notice that none of those careers lasted.) What was I thinking? I finally started writing seriously in 2001. I made a brief stab at mysteries with romance, but I simply don’t have a romance voice, so I turned to mysteries full time. And I loved it. I think I’ve used everything I ever learned in all the other temporary professions, and I still have a lot of material to work with. When I started writing, I had no idea what I was doing, much less how to get anything published—that was a very distant dream. I just knew I loved doing it. I can’t imagine anything I’d rather do. All these years later I still love writing, and I’ve still got plenty of ideas. three million words in print, not including the abandoned drafts and simply bad early efforts. That would have been unimaginable when I started, nearly 20 years ago. And I am grateful for all the people who have helped me (and not laughed at my orphaned manuscripts), and particularly the people who have read my books and made nice comments. Thank you, everyone! Lucy: Sheila will be here today answering comments and questions, so bring them on! ABOUT THE LOST TRAVELLER: Boston expat Maura Donovan came to Ireland to honor her grandmother’s last wish, but she never expected to stay in provincial County Cork―much less to inherit a house and a pub, Sullivan’s, in the small village of Leap. After a year-long struggle to stay in the black, Sullivan’s is finally thriving, and Maura has even brought back traditional Irish music to the pub. With a crop of new friends and a budding relationship with handsome Mick Nolan, Maura’s life seems rosier than ever―but even in Ireland, you can’t always trust your luck. It begins with Maura’s discovery of a body in the ravine behind the pub. And then, the Irish gardaí reveal that the victim’s face has been battered beyond recognition. Who is the faceless victim? Who wanted him dead? And why was his body dumped in the backyard of Sullivan’s Pub? Even after the dead man is finally given a name, nobody admits to knowing him. In the tight-knit world of Leap, no one is talking―and now it’s up to Maura to uncover the dark secrets that lurk beneath the seemingly quiet town. Congratulations, Sheila . . . three million words in print is an awesome accomplishment. And a new County Cork Mystery . . . I’m looking forward to reading it. I’m sure you love all your stories [as do your readers], but I wonder if you have one that is a particular favorite? If so, what makes it the one you recall most fondly? My first impulse is to say the County Cork Mysteries, because (corny as it sounds) West Cork is the home of my heart, since the first time I saw it. But the Orchard Mysteries came first, and they are set in a house that was built by one of my ancestors, and where I've spend several nights (when it was a B&B), so I know the house, the history of the town, the region--and a lot more about apples than I did when I started the series. But to go back to your original question, in Buried in a Bog, when Maura has just arrived in Ireland and is still mourning her grandmother and trying to figure out what she's going to do with her life, at one point she bursts into tears and demands, "Why is everybody being so nice to me?" That was something she had never expected to find. Wow! Three million words is mind boggling! Congratulations on an amazing achievement, Sheila. I have been trying to get to this series for a while, and I have to say that this new book is one I don't think can wait. I don't like starting a series this far in, but I've done it a couple of times, and it worked out fine. I just can't pass it up. Thank you. Maura is still learning about Ireland, and there are a lot of things she hasn't encountered yet, so there's more to come. Heck, I'm still finding out new things, after visiting for twenty years. The nice thing about being a tourist is that you can ask dumb questions, like, "what the heck is that?" Wow, three million words is quite an accomplishment. And congratulations on the new book! Three million words in print!!! Awesome! And not including the other ideas that didn’t make it.... I never thought about in terms of words, but that is a tremendous accomplishment. Congratulations!! And please continue to write. I love your stories and look forward to the new book! Thank you so much for all you do!! I hadn't done a count until recently, and then I was shocked. I know how long each book is, more or less, but I'd never added them up. I figure I'm making up for lost time--all those early years trying out different professions. Clapping for Sheila, who has long been my role model for productivity - and great storytelling! Hey, you're catching up! The Irish are reputed for being storytellers. Since Ancestry thinks I'm 3/4 Irish, I might as well go with the flow. Wow, three million words! That is mind boggling! I love the Band-Aid story! My mom used little glittery beads that came in long, narrow vials for her crafts. When she was done with them, I would ask for them. I would then write messages on small pieces of paper, roll them up to fit in the vials. I would then find places in the brick wall that surrounded our yard where the mortar was loose or crumbling and fit the vials inside. I always thought that someday they would be found and it would be a mystery for someone to solve! Hey, I was a bored, imaginative only child! What a delightful, clever game! What an interesting idea! Did you ever go back and look for them? I love finding unexpected items, and put all yours together and you would have a story. I’ve read a lot if your three million and enjoyed it. I particularly like your historical series set in NE with the couple that sees their ancestors. I like your Irish series and love when you travel there. I’m also looking forward to your next book in the historical town series. Three million! That's quite a milestone. Congratulations, Sheila. 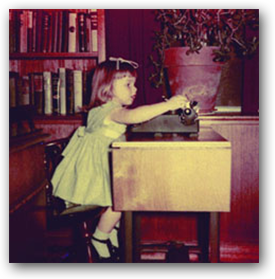 Love that photo of you - we had a manual typewriter on a table with drop leaves just like that one. Takes me back. I can remember how it smelled. I may still have it buried in my attic. My mother, my father and my grandmother all had the same Smith-Corona electric model, and I used to think it was a treat to "play" with one of them. And look at what happened! Wow, three million! Congrats, Sheila. I recently started reading the County Cork series and am enjoying it. In another comment you mentioned that you've been visiting Ireland for 20 years. Was the first visit to do geneology research and/or meet relatives, or did you discover your Irish heritage later? My father's family was Irish (from Carlow and Cork), but my parents divorced when I was 12. I never knew the Irish side until my aunt's funeral. (My mother, on the other hand, was an ardent fan of all things European, particularly royalty.) By 1998, when my daughter was 13, I decided it was time to see Ireland, which we combined with a trip to England and Wales. I knew a little about the Connolly family tree, but we did pay a visit to a genealogist in Ireland, and the next year my second cousin brought me a diagram. But that first trip was about 20 percent genealogy, and 80 percent getting to know the area. We stopped in Carlow, where my grandmother was born, but only for lunch and a visit to the cemetery. We reached Cork in time for dinner, with no reservation booked, in the pouring rain, and ate a forgettable meal. But the inn keeper (yes, it is called the Leap Inn) found us a place to stay, and the sun came out the next morning, and I was hooked. It helped that the first thing we saw when we reached the main street was the pub Connolly's of Leap. No relation (that we know of), but I've been back many times and I know the owners. What happens there, like bringing back the music, and for the next book, expanding the kitchen to serve food, are things that actually happen at the "real" pub. And the ravine next to the pub, that appears in The Lost Traveller, is definitely there, as is the story about Donovan and his horse. I have to add that when I tell a stranger there that I'm a Connolly, they treat me like a long-lost cousin, even though they've never met me. There are a LOT of Connollys in the neighborhood. That is so cool. What a wonderful way to learn more about your family AND material for your books. Terrific accomplishment, Sheila! I must tell everyone how good this book is and how much I am learning about Ireland. I just went out and bought some Kerry Gold butter and tomorrow I plan to bake some bread and see if I can tell the difference. I sometimes think I have met half the cows who contribute to Kerrygold butter. I've read that there are more cows than people in Cork. Including across the road from my cottage there. Sometimes we carry on conversations--they're usually curious. Anyway, the butter is softer than most US brands (easier to spread), and the salted kind is a bit less salty than American butter. For bread, try to use coarse flour for brown bread. Love Kerrygold! I buy it unsalted at Trader Joe's. Sheila, all those different paths were simply building the skills you'd need to succeed as a writer--3 million words in print--I'd say you've succeeded! The County Cork mysteries are my favorites because I've got more than a bit of Irish in me and I love learning things along with Maura! Three million words in print... that is an amazing achievement. Looking forward to reading your new book! I love your Nancy Drew connection and your road to becoming an author! Your books are wonderful, and 3 million words in print is just -- WOW! Thanks for sharing with the Jungle Reds! My grandfather was the last child of ten. Lots of opportunities for relative! (I did connect with a 4th cousin in Australia, but that was on my grandmother's side. He was an interesting guy (we had a couple of meals together)--he started out as a dentist, hated it, and became a librarian. Welcome to Jungle Reds! Amazing that you met the granddaughter of Nancy Drew! I mean the creator of Nancy Drew. What was it like being a professional genealogist? Your new book sounds interesting. I wonder if the Irish gardi would have access to dental records or DNA testing to find out who the victim is? Have you visited Ireland in real life? Ireland is on my bucket list of places to visit in the future. I know that I've been quite taken with the County Cork series overall after I started reading it following meeting you last summer with Edith Maxwell and Barbara Ross at a talk/signing on the Cape. I'm slowly working my way through the series as they sit in my TBR pile. I'm glad to see that there is a new book out, though sadly I haven't yet picked that one up. I will endeavor to change that. I can't imagine the pains of being a professional genealogist. My mom did it on an amateur basis and that was very involving for her. With three million words in print, are there any words or phrases that you haven't figured out how to work into your stories? And as an off-topic aside for the rest of the Jungle Red writers and readers, Edith Maxwell (as Maddie Day) is doing a talk/signing at the Barnes and Noble in Hyannis today at 1pm! Be There or Be Square! Congratulations! You deserve to celebrate. All good things come to those who are patient, talented and wait. How wonderful! You books are a pleasure to enjoy. Sheila, I am so excited that you are with the Reds today! I quite by accident stumbled onto Buried in a Bog early last year and fell so in love that I have devoured the rest of the series and am eagerly awaiting the new release. I absolutely love the characters, the setting, and the voice of these books! Now that I see what a prolific author you are, I will have to go check out some of your previous series. Congratulations on this milestone. I hope you write three million more! What an accomplishment. Your post was fascinating. The background, family and writing interested me greatly. Keep writing so that we can keep reading such intriguing novels. Congratulations Sheila. I don't think I even know 3 million words! I'm off to have a look at your series as the urge to visit Ireland overtakes me. Sheila, I had a similar experience - right down to the stint in non-profit fundraising! When I sold my first novel at 40. I also wondered why the heck did it take me so long to see the vocation that had been calling out for me since childhood? In my case, I attribute it to the fact I had never met or even had a friend-of-a-friend who made a living writing, and of course, in the pre-internet age the only thing I knew about authors were black and white photos on the back jacket of their books. It seemed as inconceivable a career to me as alchemy. Exactly. I don't recall ever meeting a writer back in the day. Although my parents were very proud of the fact that when they first married they lived down the hall from a real live writer (Robert Ruark, who I believe wrote Uhuru). Not that they ever exchanged a word with him, but they knew who he was. My father used to hang out at Costello's Bar in Manhattan in those same early years. So did Frank McCourt, at the about the same time. I keep fantasizing that they were drinking buddies and had great conversations. It's a bit too late to ask them. Sheila, nice to see you here on JRW! Wow, three million words. I think you found your true vocation. And how. I’ve enjoyed the County Cork series SO MUCH! Can’t wait to tead the latest! Congratulations on your new release! We spent 2.5 weeks in Ireland last October and drove through County Cork from Killarney (my favorite place) to Cashel and Kilkenny. Lovely, lush, soothing green landscape. I'll enjoy your books more having experienced the country. We were clearly American tourists, and everyone we encountered was friendly (especially after they "tested" my reaction to the current political scene). Stopping to pet a dog often turned into a thirty minute chat! It really gets to you, doesn't it? And people there do love to talk. I've been to Cashel a couple of times--it's a fascinating site. I was in Leap in the fall before the last election. I found opinions pretty evenly split, which was interesting. I had long conversation standing at an ATM machine with a young man who split his time between Ireland and Belgium and who home-schooled his children (who were with him). His wife was American. He clearly loved to talk. You never know what you're going to learn from people. Hi Sheila! Love the photo, and love the cover! I don't know what rock I've been living under but I haven't read the County Cork books. Just ordered the first one and looking forward to a lovely Irish binge! I first heard of Sheila's books in my writing group. One of our members had picked up her first book in Ireland at an airport bookstore. I bought it and loved it. So meeting her at Malice was like meeting a star. Three million words! You are a rock star. I'm so glad you found it! I'm intrigued by how many American mystery writers appear in almost every bookstore I've been into in Ireland (and many towns have more than one bookstore!). I try to grab those by Irish writers because they're hard to find in the US, if you've even heard of them. At least there are a lot of readers there! You wrote stories in Spanish and French as a child?! Wow. I look forward to the latest offering. Sheila, I loved your Orchard Series but didn't know about the County Cork one. As I loved Ireland so much when I visited,I'll begin the series at the beginning. Very impressed with your 3,000,000 words. Hi Sheila, Congratulations on all those words! I have only read Buried in a Bog and thoroughly enjoyed it....definitely need to catch up! I've read all of your series but did drop the ghost one since that's not my thing. I like the Philadelphia one because it's Pennsylvania and has a museum. The apple one is good because I like hearing how she manages the orchard. I did visit New England several times and Ireland once so I can picture what you're writing about. I'm glad that Maura is having food in the pub. What a cute picture! I enjoy all your posts about your books and Ireland! I liked Nancy Drew too. (Cool neighbor story). DId you ever real Phyllis Whitney's young adult mysteries? I always liked the exotic locales. 3 million words? That is a very impressive milestone. Congrats! Interesting about Nancy Drew I babysat to buy those books, very interesting about the real pub giving ideas for your books. I do enjoy both series very much. 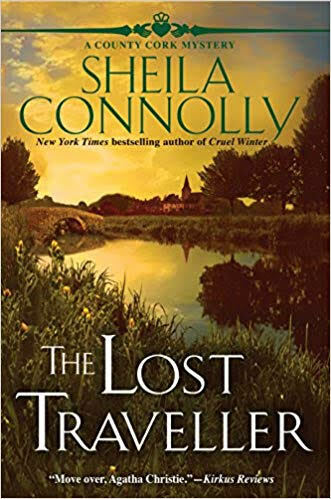 I can’t wait to read the lost traveller. Congratulations on your book! Thanks for offering the chance to win it! A Change of Pace? Or Place? It's New Year's Check In Day! And pick a word!